What will be noticed are the opening chords of Mark’s guitar and vocals with a harder edge rock, he has laid down the gauntlet with the opening track Outside Inside, the squeal of the guitar in the controlled lead breaks full of shape and texture defines his second album building on the achievements of Days Of Destiny. Mark is double trouble piling on the surprise with guitar work that is blisteringly good and vocals that ensure the group is a powerhouse of sound. His support is a rhythm section that smoulders and burns depending on the style Mark has set the team Alun Walters on bass and Dafydd Davies on drums and Ayesha Pontin on keyboards and vocals. This is an album brimming with determination and confidences as the chords form and the rest of the band pick them up so that Textures appear sweet, and rough, smooth and complex your musical attention is never lost, with every listen there is something new to catch you attention but every time it is the lead breaks from the scorching six-strings that is Mark’s guitar that totally mesmerise and delight. Then the tempo alters with the blending of harmonies that are like a gentle sea breeze that stirs up golden smiles on Change demonstrating only two tracks in that Mark is never boxed into a tight corner musically. His layering is artful layers of sounds with shading that allows for subtlety, space and the rip roar of power rock into a single track Three Days is just compelling listening. The whole album is a vehicle for his adroit approach to music from song writing that never over complicates but ensures the narrative compliments the music being delivered, this ability to hone the music so that it leaves space is a rare ability in the desire often to add an extra chord, play faster be ever more complicated. Mark Pontin Band demonstrates that the melding of rock blues and jazz can be done with a light touch that entertains the listening ear. The guitar opening of Rising Before the Dawn is dull of promise of a controlled bluesy number and the journey of textures continues as he delivers another cracking track. 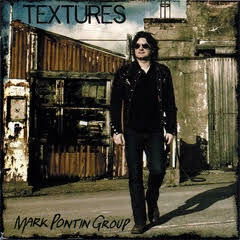 Half-way through an aptly named instrumental In The middle the tonal cadences once again take a new journey with a progressive number that has guitar and drums interacting with a beat that drives the album musically on as we see another aspect of the talent that is the Mark Pontin Band. The second half of the album continues to build on the sounds explored with a sting blues number Good Stuff and a reminder of the smooth qualities of his vocals. This is an album that explores the power of vocals and guitars and there is a shape and purpose to the journey the various tones and musical styles with the acoustic instrumental Going Home completing the musical journey and the Textures and emotions all make perfect sense as the music says it all.